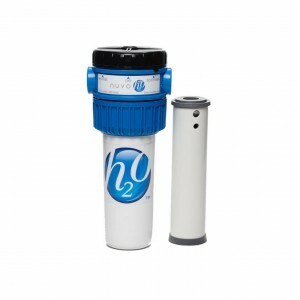 The NuvoH20 Water Softening System is a unique product, because it is not only compact and easy to install, but unlike most conventional water softening system, the NuvoH20 requires no salt to be added to the system. Instead the NuvoH20 uses citric acid to soften the water by binding to calcium ions, preventing them from precipitating out and forming scale, that you would see left on your dishes and shower stall door. The NuvoH20 system uses proven scientific principles to reduce hard water buildup and doesn’t require any electricity to operate. An unlike the magnetic water softening system which does not isolate the calcium ions, this system is more effective and can soften even large homes with up to six or more occupants. 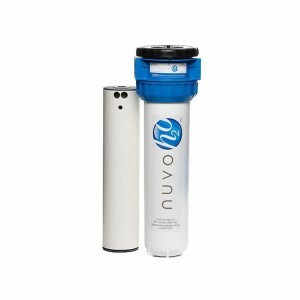 The NuvoH20 Studio Saltless Water Softener System is an ideal solution for apartment or condo owners, who have hard water problems, yet want a compact system that does not require extensive upkeep and is compact. If you live in a condo unit, the last thing you want to do is be hauling salt up the stairs or to the elevator, just to replenish your water softener. With the NuvoH20 Studio system, you can soften your units water, without using any salt and all that you have to do is replace the cartridge in the unit every few months. The NuvoH20 studio system is ideal for studio apartment or condo’s that are under 1000 square feet or a little bit above. The system can treat up to 20,000 gallons of water before you have to change out the water softening cartridge and can be easily installed by a handyman or condo/homeowner very quickly. The NuvoH20 Home Water Softener System is designed for homes between 1000 to 2000 square feet, the system can soften up to 35,000 gallons before the cartridges need to be replaced. The beauty of the system is that it attaches to the cold water main line, requires no electricity to operate and doesn’t require you to replace any salt. In fact the NuvoH20 Home water softener system, uses citric acid, found in limes and lemons to provide a natural organic water softening solution. Once every six months, all you have to do is unscrew the cartridge from the system, screw in a new water softener filter and you are good to go. Owners of the system are happy with the fact that the system is easy to install, the vast majority of home owners can install the system themselves in about a hour, and the maintenance of the system is minimal. 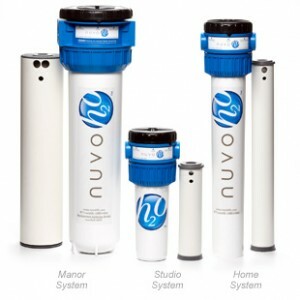 The NuvoH20 Manor Saltless Water Softener System is the largest system that Nuvo offers, as is perfect for large homes with up to 6 or more occupants. It can filter over 65,000 gallons of water before the cartridge has to be replaced and is ideal for homes over 2000 square feet. The fact that it is a saltless system, makes it ideal for people with heart conditions or those people that have to watch their salt intake. Installation is a breeze, since it does not require any electricity to be run to the unit and can be considered a “green technology” in the fact that it doesn’t require any maintenance or salt replacement. Keep in mind that while the saltless technology can replace conventional water softeners, if you have particularly hard water, it is not recommended, since you will go through filters quicker and it will not be able to keep up with your water consumption needs. However, for most homeowners with mild to moderate levels of had water, the nuvoH20 manor system, provides an ideal, compact system with no moving parts that is convenient and eliminates the problem of hauling bags of salt down to the basement. 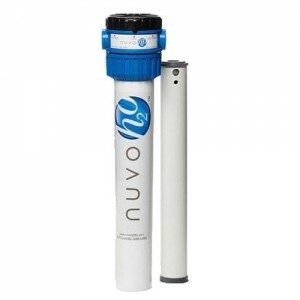 To wrap-up our review of the NuvoH20 Saltless Water Softener System, the units provide an efficient, yet effective way to eliminate hard water buildup in your condo or home. There are three systems that are customized for your home or usage needs and the operation and installation of the systems are incredibly easy. They are ideal for homeowners who may have heart conditions or those that have to watch their salt intake and the NuvoH20 are safe and eco friendly. So if you have hard water buildup, and want an efficient water softening system that requires no electricity, has no moving parts and instead works on proven scientific principles, than the NuvoH20 water softeners are ideal for you. The only drawback to the NuvoH20 system is in areas where owners have unusually hard water, in these cases a conventional water softener that uses salt maybe more cost effective, since it will increase the time between when you have to change out your water softener cartridges.